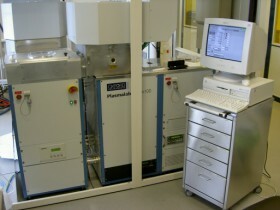 AMO runs a class 10 to class 1000 cleanroom with a total area of 400 m²: Nanolab AMICA. Here, high end fabrication equipment for semiconductor technology is operated in a highly flexible way to enable high quality nanofabrication, quick process changes and unconventional solutions. AMO is, as a matter of principle, a R&D company with several research and development projects within a lot of different research fields and offers high flexibility regarding customer orders. 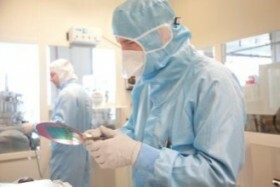 This is based on 20 years of experience in micro- and nanotechnology. As a result, we are not organized like a big wafer fab, AMO is in fact organized in a way that for all customers and partners the best individual solution is found, with low processing times and lot sizes matching the customer’s needs. Thereby, great attention is paid to the customer’s satisfaction. All the listed euipment below is made available to interested customers and partners in the framework of our services branch. For a concrete proposal please do not hesitate to make direct contact for a tailor-made solution combining all the necessary tools and processes meeting your specific demands. 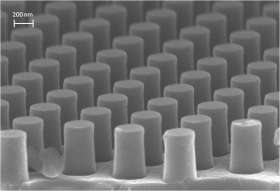 The highly developed nanolithography is embedded in a CMOS compatible pattern transfer for silicon substrates. The whole process chain is continually refined and adapted to the visionary demands of a steadily changing market. 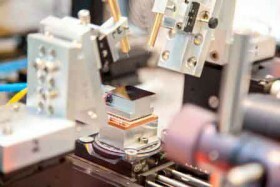 For deposition of high quality thin films, dielectrics and metals, AMO offers a wide range of different techniques enabling thicknesses of the deposited or grown material layer from several angstroms to some microns. The substrate is exposed to reactive gases which decompose and react on the substrate surface forming the desired deposit. By using low pressure (sub-atmospheric) unwanted gas phase reactions are reduced and the film thickness uniformity is enhanced. The adequate solution for very thin, conformal films with perfect control of the thickness and layer composition is the atomic layer deposition (ALD). 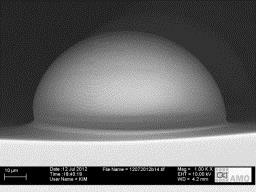 The involved precursors react sequentially in a self-limited way with the surface to form the desired film. 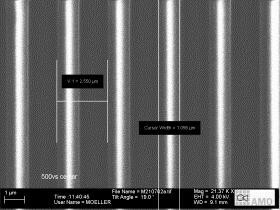 In contrast to CVD methods, sputtering and evaporation are PVD (physical vapour deposition) methods. The material vapour here is generated physically either via collision ionization (sputtering) or via heating (evaporator). The material vapour condensates on the substrate forming the desired deposit. Materials: W, Ni, Ti, TiN, Al, AlSi, AlCr, SiO2, Ta2O5, Al2O3, HfO2, etc. Materials: Al, Cr, SiO2, Ti, Ta2O5, etc. AMO has different furnaces available, used at different stages along the process flow for high quality micro- and nanoelectronic devices, ranging from growing high quality silicon oxides to high temperature annealing. Wet processing is carried out in dedicated areas for handling wet chemicals including areas with amber light for handling lithography resists. 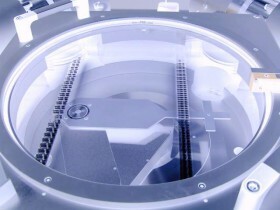 To allow for a maximum of flexibility of processable substrates wet benches and tools are provided to handle wafer pieces, single wafers as well as wafer batches. 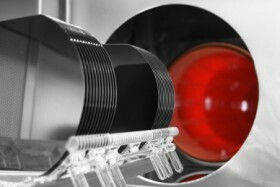 In order to ensure process control and device characterization AMO has different measurement equipment available, for measuring diverse parameters, during processing as well as on the finished device. Typical parameters of interest during process control are e.g. layer thickness, layer roughness, layer composition, lateral dimensions and distances.